[T]oday’s society presents to the enculturation of the Gospel; but I trust that your audacity and apostolic fervor – born of a personal encounter with self and with Christ – will lead you to make history for the good of all. So that, many brothers and sisters, marginalized or not, who live on the fringe may feel embraced by the love of Jesus. With Eduardo Bonin, self-titled “Christian Apprentice”, Founder of Cursillos in Christianity. [T]he tiny seed planted in Spain more than 50 years ago has become a great tree laden with fruits of the Spirit. 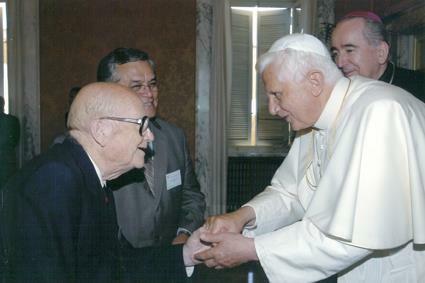 Indeed, it continues to be a successful response to the question asked by my venerable Predecessor Pope Paul VI at the first world Ultreya in Rome: “Can the Gospel still win over the mature person … in urban and rural cultures? …[T]he message of Christ almost always opens participants in a Cursillo to the gift of conversion and to a deeper awareness of the Baptism they have received and of their own mission in the Church. They feel called to be the prophetic “leaven” which is kneaded into the dough so that the whole mass will rise (Mt 13: 33), to be the “salt of the earth” and the “light of the world” (Mt 5: 13-14), to proclaim to everyone they meet that only in Jesus Christ is there salvation (Acts 4: 12), and that it is “only in the mystery of the Word made flesh that the mystery of man truly becomes clear” (Gaudium et spes, n. 22). Cursillos, like similar ecclesial movements, are characterized by a new evangelization of adults. The Christian message is presented through moments of intense spiritual experience that enable them to rediscover the beauty of meeting Christ and of being Church, as well as the joy of brotherhood and mutual service, while imbuing their whole lives with the Christian spirit. “Whether some methods become obsolete, whether new manifestations of the Spirit arise, the permanent task of the layman will continue to be the infusion of Christianity into life through the encounter and personal friendship with God and in communion with his brothers. The layman, upon forming himself in Christianity, reforms his mentality and conforms his life to Christ’s image by means of faith, hope and charity; acting with complete responsibility he transforms the temporal structures in which he is immersed, guided in his action by the glance of Christ he continually tries to remake the world according to God’s plan and design…. Beloved sons and daughters: Our soul is so oppressed by the vision of the evils which afflict the Church and mankind. But permit us to express our overwhelming joy that, at this moment, floods our soul before the immense chorus of your manly faith in Christ, your fidelity to the Church, your fervent loyalty to this Chair of Peter and to the ministry of the episcopal hierarchy. “Cursillo’s de Cristiandad! Christ, the Church, the Pope, are counting on you!